PowerMac G4 AGP (Single Processor) Upgrades - Upgrade Your Mac! This group of machines are all based on the Sawtooth architecture, and it includes the G4 AGP original and the Gigabit Ethernet series of single processor machines. There are also dual processor Gigabit Ethernet machines, which are dealt with on this page. These units brought the G4 7400 series of CPUs into the Mac line up. The first machines came out in September 1999 and stopped production October 2000. They shipped with a 16MB AGP Rage128 graphics card, and a different CPU socket from the preceding G4 PCI Graphics. These machines all shipped with DVD-ROM or DVD-RAM and had two USB ports and two FireWire ports. These are excellent machines, and can be significantly upgraded for a very reasonable amount of money. 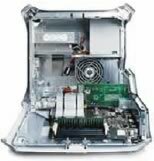 MacUpgrades has an article online which goes into detail about recommended upgrades for the PowerMac G4 AGP. This page deals specifically with single processor 100Mhz bus speed PowerMacs with an AGP graphics chipset. These machines are part of the ranges known as the AGP Graphics, and Gigabit Ethernet PowerMac G4s. Most Gigabit Ethernet machines had dual processors, but these machines are dealt with on this page. These PowerMacs can be fairly easily distinguished from other G4 towers. They are in a graphite coloured case, unlike the silver case used on the G4 Quicksilver and above. The rear of these PowerMacs have two audio sockets which are aligned vertically from the bottom of the port panel. Turn the machine off and open the side of the case. Internally all G4 AGPs have four memory sockets (black in line sockets - see picture) towards the top of the case. The PowerMac G4 PCI Graphics also have four RAM slots, but the audio ports on the back of the machine are aligned horizontally. Graphite coloured PowerMac G4s later than the Gigabit Ethernet range have only three RAM slots. You will notice four differing expansion sockets, some will be used. The first of these is a brown socket which is called AGP. If your machine does not have AGP it may be a G4 PCI Graphics. The other 3 sockets are for PCI Expansion cards. There is space for a number of internal hard drives to the rear of the machine. The PowerMac G4 AGP Graphics has four memory sockets, any of these sockets can take up to a 512MB module. When they were released, these PowerMacs could only address a maximum of 1.5GB of RAM, despite the fact that 2GB could be physically installed. However under OS 10.3 (Panther) and above these machines can address the full 2GB. Apple's instructions can be found here. Excellent instructions can be found on Apple's website. The PowerMac G4 AGP can can take internal IDE hard drives of sizes up to 120GB. Up to two extra drives can be added alongside your existing hard drive - a straight replacement is obviously possible as well. Your PowerMac G4 AGP Graphics has one available AGP socket for upgrading your video capabilities. You also have three 33MHz PCI slots, which can take a second graphics card - however the AGP socket is superior and should be used for the primary graphics card. Open side door and locate the (brown) AGP socket. Remove holding screw and remove the original card. Open the side door and locate a free (cream coloured) PCI socket. To fit an Airport card, refer to Apple's guide here. 1 For models with a DVI video output port. 2 For use with an eSATA PCI card, e.g. Sonnet Tempo X4P eSATA PCI/PCIX Card, to connect to an eSATA external device.